Brand new episode fresh off the smoker! Enjoy and share with your friends! Joe and Brian discuss some feedback they received regarding the amount of time Brian spends talking on the show as compared to “Uncle Joe” from our unbiased, unofficial “Talk Time Manager”, Isaac (Joe’s nephew). Facebook Poll coming soon. Congrats to our first “Find the Fountain” contest winner: Caleb! Caleb posted a picture of himself in from the “Muse of the Missouri” fountain at the corner of 9th and Main downtown. There’s another fountain to find in this episode! The MLB Hall of Fame travels to the K. The Chiefs have their eyes on the St. Louis market now that the Rams are back in LA. Blue Springs hosts the Spirit of Fire Fighting Artwork contest and so you’ll be able to walk and bike on paths once traveled by the pioneers. Boulevard Beer opens it’s huge visitors center and we check out some of the top places to in Missouri (short list). We have local event recommendations and talk Steers and Beers. Great local music from Katy Guillen and The Girls and We Are THE DARK DARK! Here’s a new episode hot off the smoker. 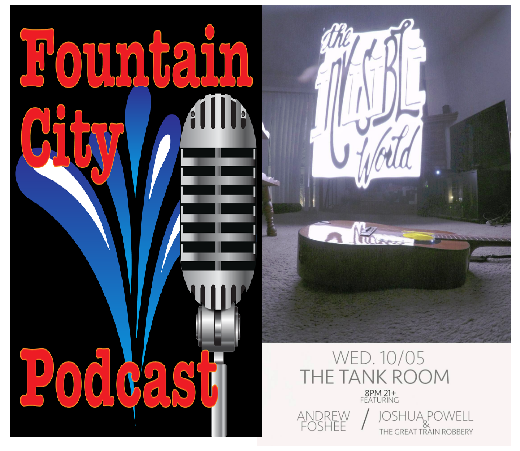 Local music from Via Luna and The Philistines.Brian and Joe talk about the Missouri Mavericks losing their coach, prehistoric adventures at Powell Gardens, a new book on Royals history, and the possibility of the KC streetcar expanding to the Plaza. Joe pays a visit to Mayberry’s Country Store and Produce– not the town. Gomer says “hey!”. The food segment focuses on North KC Hotdogs, the top 10 burnt ends restaurants in KC, Joe’s KC shipping BBQ to you and McGonigle’s BBQ Trailer debuts. Old Boulevard gets a new life as a spirit, get your espresso and beer at Colony and Restless Spirits Distillery opens. E20 A $48 Dollar Dash of Something! FCP Extra Episode 18.5 features an interview with Joe‘s niece Tiffany Shaw from Tiffany’s Treasures about her book sculpture business and the project she’s working on for Royals catcher Salvador Perez.